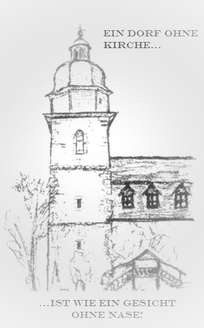 Our society was founded in September 1996 by Pastor Gerstenberger in order to support the congregation with the preservation and restauration of our St. Martin- und Johannes Church, and to support the advancements with own initiatives and fundraising activities. Furthermore, our organization is part of the Bielener Heimatverein ( historical and heritage society), which engages itself in the study, review and collection of our town's history. Our nonprofit-organization is officially registered as "Bielener Kirchbauverein e.V." with the local court under 41VR 516. Our organization is legitimized to accept donations for ecclesiastical purposes and is allowed to issue receipt of donation according to official requirements (§ 50 Abs. 1 EstDV). Member can become anybody who accepts the statute of our nonprofit-organization. The membership fee amounts to 13,- € per year. Currently, we have 18 members and 3 honorary members (as of 01/08/2006). Even non-members can be a part and take part in our activities!